Atlanta’s posh new hotspot features a “wine wall” curated by celebrated sommelier Andrea Robinson, Southern fare overseen by Chef Linton Hopkins, hip décor provided by emerging artists and dramatic views of the city skyline – and sunset. This is an airport lounge? Yes. 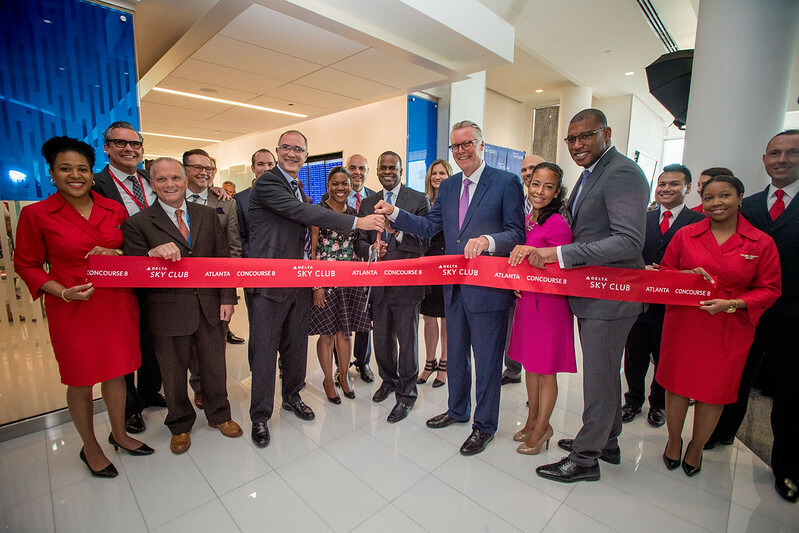 It’s the new Delta Sky Club in Hartsfield-Jackson Atlanta International Airport’s Concourse B, which hosted more than 500 guests during a private unveiling Tuesday night. The Club opens Friday. 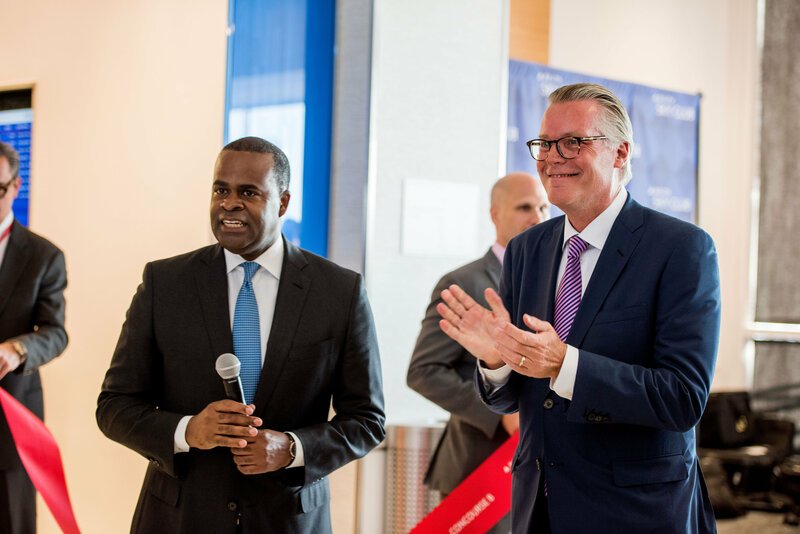 Bastian, speaking alongside Atlanta Mayor Kasim Reed, said the Club is a testament to the special relationship between the airline and its hometown, a sentiment Reed echoed. 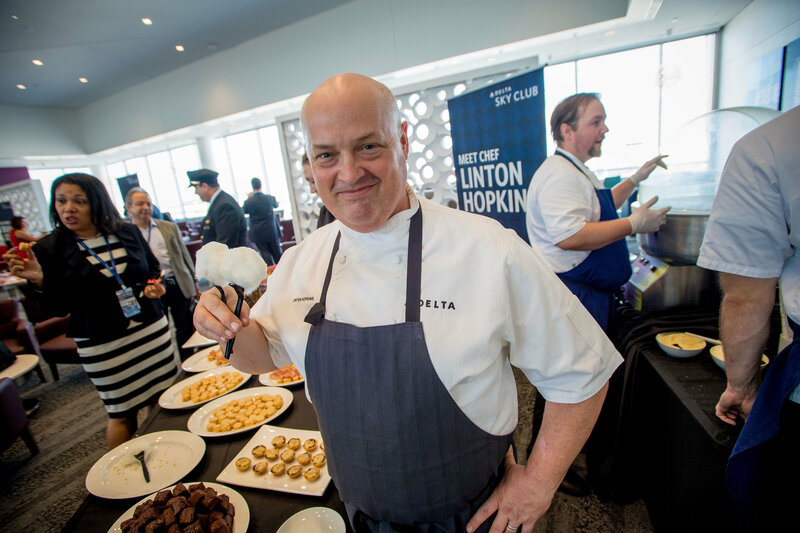 The spacious Club – Delta’s second-largest – follows the airline’s strategy of giving each new Club a sense of place. It features locally sourced fare, craft beer from Georgia breweries, artwork from seven Atlanta galleries and other local artists – including iconic homegrown subjects such as Coca-Cola, Hank Aaron and a Warhol-esque take on Delta founder C.E. Woolman. And the Club’s modern design features tiered ceilings bracketed by massive windows to let in the Southern sun and afford views of downtown. “This is an Atlanta space,” the mayor said upon walking into the reception. Continuing the theme, guests enjoyed an acoustic performance by Atlanta-based singer Grace, whose music was featured onboard as a Delta Spotlight Artist, as well as opportunities to meet former Atlanta Braves star Brian Jordan and Atlanta artist Alexi Torres, who designed a retro-yet-contemporary aviation mural featured in the Club. Underscoring Atlanta’s status as an international hub and city, Grace originally hails from Australia while Torres is Cuban. In an interview, Marc Ferguson, General Manager – Sky Club Experience, expanded on Bastian’s comment on the Club as a refuge. Sarah Carrick, a trade show coordinator from Charlotte, was multitasking Tuesday night. 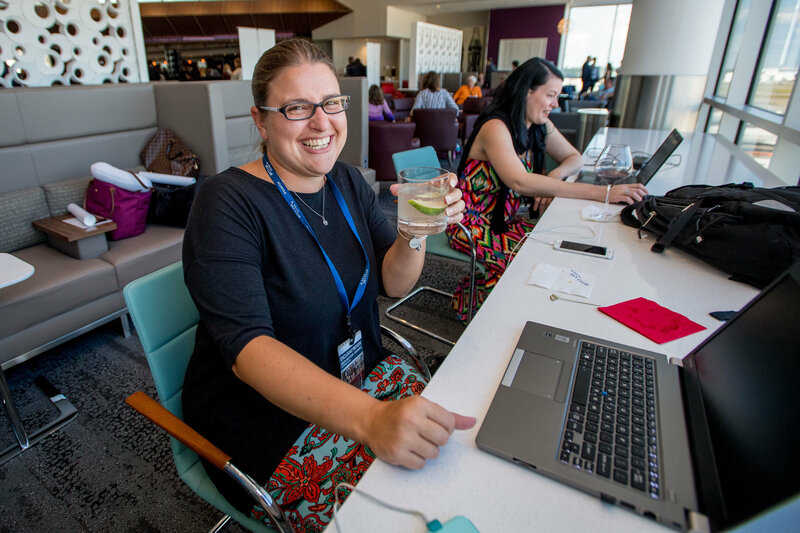 She sat by one of the massive windows overlooking a runway, two phones charging, laptop out, cocktail by her side. Ferguson noted the different types of seating. There are tables for work sessions, leather chairs grouped for conversation and high-backed pairs of seats called “hush pods” for intimate talks. “We hope guests notice the thoughtful touches,” Ferguson said, noting that Sky Club employees play a crucial role. “It’s about the space, but it’s more than that. We’re trying to build a culture of service around hospitality and employees are embracing it. Guests are noticing. Located at the center of the concourse, adjacent to Gate B18 at Hartsfield-Jackson Atlanta International Airport. Expected to become one of Delta’s busiest Clubs, since Concourse B is the busiest in the Delta system. Offers 500 seats in 24,914 square feet. Delta’s second-largest Club, next to New York-JFK. Built during the past year, the Club is suspended over the tarmac by 455 tons of steel trusses, beams and cantilevers.